ARTE FIERA is preparing a special edition to celebrate 40 years of the event, together with the city and Italy’s modern and contemporary art galleries. The exhibition is growing with an extra pavilion for art and photography. In tribute to the 40th anniversary will be the exhibition “ARTE FIERA 40” at the Bologna Pinacoteca, dedicated to the galleries’ role in Italian art and including the leading protagonists of Arte Fiera. MAMbo will open a permanent exhibition of works acquired from Arte Fiera over 40 years. Bologna, 30th November 2015 – Arte Fiera in Bologna is set to celebrate its most important edition: 2016 will be the 40th anniversary of the international modern and contemporary art event, the first and most enduring event of its kind in Italy. From the 29th January to 1st February 221 exhibitors, including 190 galleries displaying 2000 works of art by 1000 artists can be found within the pavilions of BolognaFiere. This anniversary will also take place during a particular moment, in a period in which the best of Italian art is enjoying an especially high profile on the international stage, art that has passed through the pavilions of BolognaFiere and owes some of its success to Arte Fiera. The galleries enthusiasm for the 40th edition has been confirmed by the demand for space that has led to the addition of an extra pavilion for Arte Fiera 2016 to complement pavilions 25 and 26. Italian artists, for some years have enjoyed success as protagonists in the international markets, so much so as to make the term ‘Italian sales’ a recognised indicator around the world. The results have been unparalleled and some Italian names have become leading actors in the art scene. For the fourth year running, Claudio Spadoni and Giorgio Verzotti, will be the art directors for Arte Fiera. Arte Fiera celebrates its 40 years with the historic partnership with the Italian Association of Modern and Contemporary Galleries and will hold the special exhibition ARTE FIERA 40 including works of artists selected from those proposed by galleries over the 40 years of Arte Fiera. Arte Fiera 40 will provide, for the first time, an overview of how the event has unfolded through a glance at the galleries, the culture and the art market in Italy. An innovative and interactive display will use archive material to narrate the history of the Fiera since its foundation in 1974. Arte Fiera has demonstrated a great capacity for analysis that has accompanied artists and movements in world art: a role that must continue, presenting new ideas and leaving space also for experimentation. In fact, this 40th edition will dedicate significant space to young Italians and to the leading international tendencies. For this edition Arte Fiera will continue its focus on young artists. 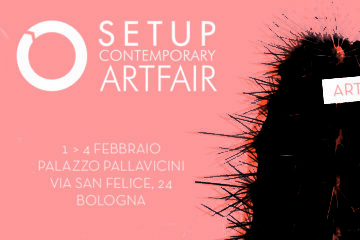 All of the galleries involved in this edition of Arte Fiera have been invited to exhibit works of artists under 40. A committee, made up of curators and directors of leading art institutions and museums, including Francesco Bonami (curator and president of the selection committee), Luca Lo Pinto (curator of Kunsthalle in Vienna), Laura Carlini Fanfogna (director of the Institution of Bologna Museums), Giacinto Di Pietrantonio (director of GAMEC in Bergamo), Hou Hanru (director of MAXXI in Roma), Andrea Bellini (Director of the Centre for Contemporary Art in Geneva), Alberto Salvadori (director of the Marino Marini Museum), will select the best works by artists under 40, whose works will be brought to the Pinacoteca to be displayed alongside those of the greats. A suggestive and unique exhibition will trace the history of the event over the last 40 years, while offering a vision of the coming 40 years. The exhibition, also curated by Spadoni and Verzotti, will provide the first ever opportunity to admire works by the greatest modern and contemporary artists together in the same space. The works and the legacy of Arte Fiera on display in the exhibition will be assembled in a prestigious book published by Corraini, which, with the help of some distinguished contributors, will narrate the evolution of Italian contemporary art, collectors and galleries and the artists that have been part of the history of the Italy’s leading event in the sector and will illustrate the role of Arte Fiera in the culture of contemporary art in Bologna. Once again in 2016 at Arte Fiera visitors will be able to admire the works of greats that have dominated the market, such as Lucio Fontana and Piero Manzoni, whose success has transferred onto the international stage. Also names such as Enrico Castellani, Dadamaino, Turi Simeti, Paolo Scheggi, who are all on their way towards gaining the same recognition, and the list goes on to include those of the following generation such as Gianni Colombo, Giorgio Griffa, Gianni Piacentino, Ettore Spalletti, who in recent years have held personal exhibitions of their work in some of Europe and America’s leading museums and galleries. The pathway that these great artists have pursued is what Arte Fiera has endeavoured to showcase for many years and the event has enjoyed significant success. This pathway does not concern individual names as the market encourages artistic currents and movements that have a key role at the Fiera, such as Arte Cinetica, Pittura Analitica and Italian Conceptual Art, which have enjoyed surprising success outside of Italy, as occurred with Nanda Vigo, Pino Pinelli, Vincenzo Agnetti and many others. But this does not only refer to recognition by the market: Alberto Burri’s retrospective at the Guggenheim in New York in recent months demonstrates that the great museum institutions have recognised these protagonists of Italian art and their place in history. A fortieth anniversary to celebrate the exceptional as well as the traditional in which the exhibition route will be divided into five sections: the heart of the Fiera is represented by the Main Section with the main modern and contemporary art galleries, within this there will be a specially curated area named The Protagonists, created with the contribution of the galleries Continua, Galleria Milano, Lia Rumma, Studio La Città, Tega. The section Solo Show offers an overview of Italian and international art with stands created by the galleries that propose special exhibitions of great artists, from the modern to contemporary. This section narrates the symbiosis between gallery owners and artists that has been so fundamental to success throughout the history of art. The section New Proposals will include galleries that present the work of those aged under 35: a fundamental testimony of the role of research, discovery and the nurturing of new talent and new languages. Also present this year, in its third edition, will be the section Photography created in collaboration with MIA Photo Fair – Milan Image Art Photo Fair and curated by Fabio Castelli: an area that confirms the global trend of increasing interest in photography as an artistic language. The curatorial project for Arte Fiera 2016 will focus once again on a series of meetings for collectors. 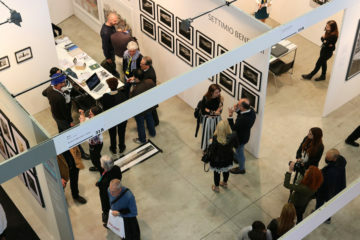 The Conversations, which will celebrate the fortieth anniversary of the event with the involvement of Italian and international experts who will reflect on how the interrelations and influences of Arte Fiera – over its 40 editions – has led to the growth of the Italian modern and contemporary art in the world. Curator Marcella Beccaria and journalist Riccarda Mandrini will curate the intense programme of Conversations that will trace the activity of artistic and scientific research that led to the creation of the exhibition and the volume “Arte Fiera 40”. Also the latest trends of the global market will be analysed in addition to the future developments of international museums from the point of view of building their collections for the future. This year’s event will also include the Prizes, awarded to artists for the effectiveness of their artistic creativity. Among the awards the Premio Gruppo Euromobil under 30 will be celebrating its tenth edition. The Group has confirmed that it will be accompanying the traditional prize conferred by a jury of experts, with a second award to be judged directly by the public. Last year’s event saw the inaugural edition of the Premio della Fondazione Arte Scienza Videoinsight, which will return this year. The prize is awarded to the work on display that is acknowledged to best transmit psycho-physical wellbeing engaging the mind and emotions, both on a conscious and unconscious level. The Premio Rotary Valle del Samoggia, in its fifth year of existence, is dedicated to the most creative installation presented at Arte Fiera. The prize, established to promote the culture of contemporary art amongst young generations and to spread the principles of the Rotary organization, is based on a close cooperation between the Distretto Rotary International 2072 Emilia-Romagna and San Marino, with Rotaract Bologna and with the Libera Accademia di Studi Caravaggeschi “Francesco Maria Cardinal del Monte”. In 2016 the fourth edition of Art City Bologna also has a packed programme of events and exhibitions as part of the project by to emerge from the cooperation between Bologna City and Arte Fiera, with cultural initiatives and the promotion of museums and places of art in the city. There will be important exhibitions this year with special initiatives organized by the leading contemporary art galleries in Bologna. On Saturday 30th January Art White Night returns. The ‘all night’ event will include hundreds of initiatives and thousands of visitors in the city that each year turns Bologna into the capital of Italian art.